Don’t fritter away the day without enjoying a tasty, delectable fried treat. December 2 is National Fritters Day! If you’re wondering haven’t they already done this before? then you have an excellent memory. Back in July we celebrated National Corn Fritters Day. Oh man, those were good! And simple to make. 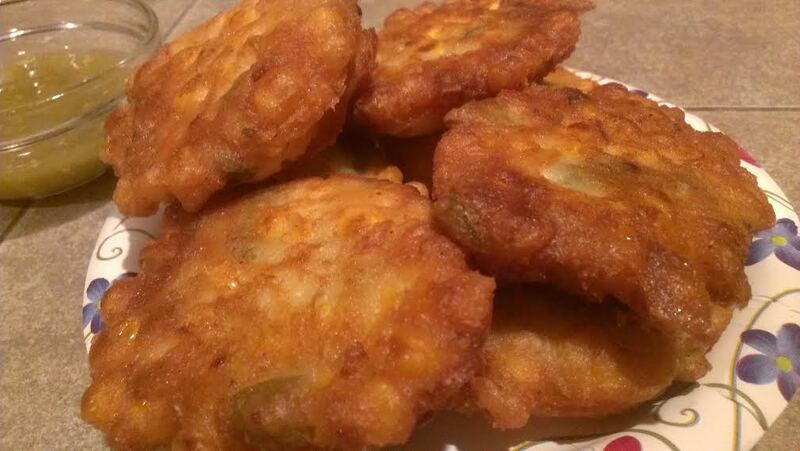 Fritters can consist of basically anything dredged in batter and fried in oil. Fruits, vegetables, and meat can all be turned into fritters; some of the more popular varieties include potato fritters, apple fritters, banana fritters, pineapple fritters, and zucchini fritters. Even crab cakes are technically considered a type of fritter, as is tempura. Well, it really wasn’t. I swear. But not long after, she made those apple fritters. Which were every bit as delicious as I remembered. The moral of the story? You can’t go wrong with a fritter. 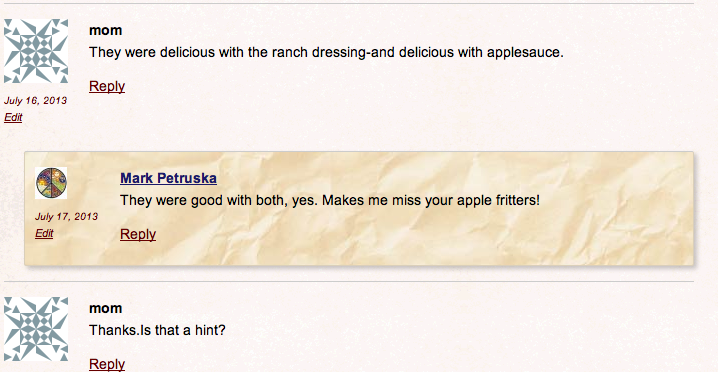 I was torn between making those apple fritters, and the corn fritters we enjoyed last time. In the end, the fact that tomorrow is National Apple Pie Day swayed me toward the savory ones. Only this time, we added more ingredients to our original recipe (follow the link above), and I’m calling them Southwest Corn and Green Chile Fritters. They’ve also got diced onion, minced garlic, salt, pepper, and were delicious dipped in a green chili verde sauce. What’s this? A healthy food holiday tucked in amongst all the desserts this month?! Be still my heart! (Or, more accurately, keep beating). June 17 is National Eat Your Vegetables Day! 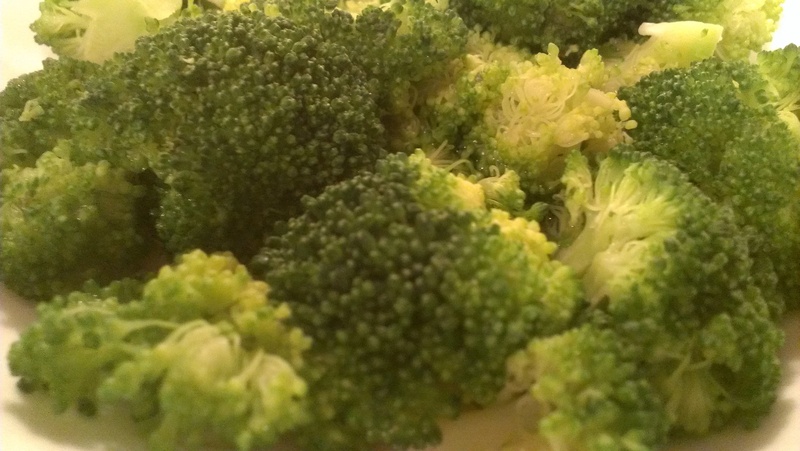 After a plethora of pies and a crapload of cakes, has broccoli ever looked so beautiful? 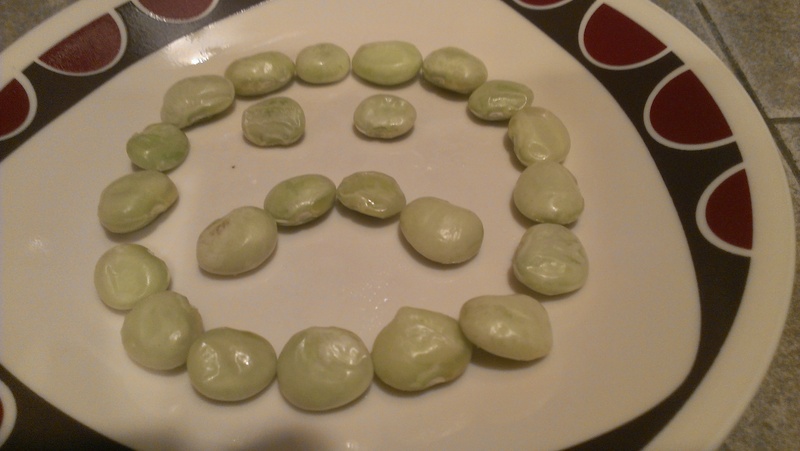 Peas so pleasing? Spinach so scrumptious? Chances are, you’ll only appreciate this holiday if you’re a grownup. Kids tend to dislike veggies, and as a youngster, I was no exception. There were a few vegetables I didn’t mind. Corn, for starters, but isn’t that pretty universal? Corn hardly “counts” as a veggie. I did always appreciate canned spinach and peas, and never minded green beans or asparagus, but there was one vegetable I hated with a passion and avoided at all costs. I was not alone in my contempt for this relative of the cabbage with the flowery head and the tough stalk. Show me a kid who says he or she likes broccoli, and I’ll call that person a liar. Former President George Bush Sr. famously declared a hatred for broccoli, and I’m convinced that’s the one and only reason I voted for him in 1988. (That was the only time I ever voted for a Republican President in my life. Can’t be a coincidence). For me, the texture as much as the taste turned my stomach. Those little flowery pieces on top always seemed to get stuck in my throat and make me gag. And then, a funny thing happened. I started to not mind broccoli so much. I think this started out slowly. A spoonful of broccoli cheddar soup here, a random floret that accidentally got impaled on my fork when I was eating broccoli beef there. One day, I discovered I could eat it without gagging. Before long, I found I actually liked the flavor. I still don’t know how that happened. I know our tastes “mature” as we age, but I’ve never started liking watermelon or cauliflower. Broccoli, on the other hand, is delicious. Some people cover it in butter or drown it in cheese. I feel like that’s cheating. 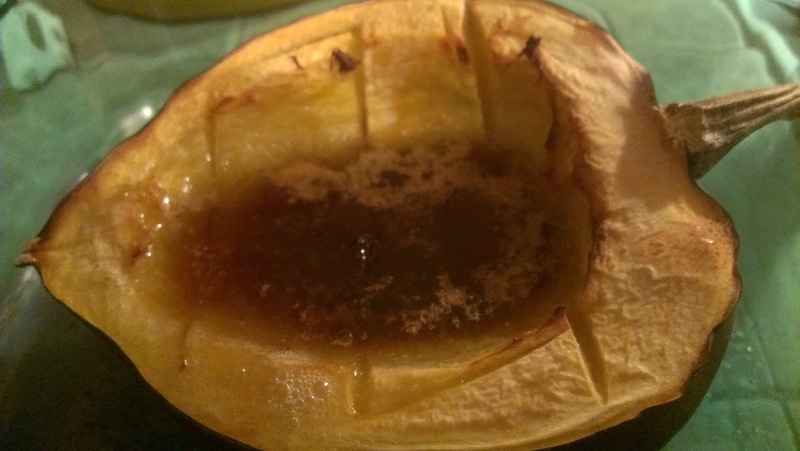 Tara steams hers with chicken broth instead of water, and it’s fantastic. For National Eat Your Vegetables Day, we had to celebrate with broccoli. It was wonderful! I’ll POP you in the EYE if you aren’t strong enough to celebrate today’s food holiday. March 26 is National Spinach Day! Spinach is one of those vegetables that a lot of kids wrinkle their noses over, but growing up I loved the stuff. Or rather, the canned stuff. Heated up and sprinkled with salt? That was a childhood fave! I remember the first time I tried “real” spinach. I was like, what on earth is THIS?! It resembled lettuce more than anything from a can. Disappointed though I was, I still liked it. How to make green eggs. There was no eating spinach from a can today, though. Tara has a great way of preparing it, and I’ll let her talk about that. A gal I work with mentioned she makes ‘green eggs and ham’ for her daughters a few times a week. 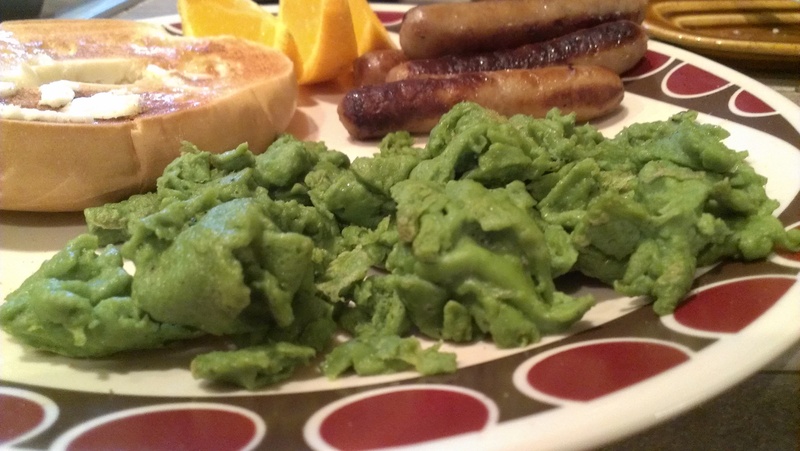 Rather than dye the eggs with green food coloring, she blends baby spinach with eggs and scrambles them up. Served with crumbled turkey bacon and a little bit of shredded cheese, it’s an often requsted favorite of her youngsters. Since I had just bought a Magic Bullet and there was fresh spinach leftover from Mark’s last batch of Italian Wedding Soup (something he SHOULD be making today…hint, hint, babe) I wanted to try the green eggs for myself. I’m glad I did because they really are delicious and nutritious. 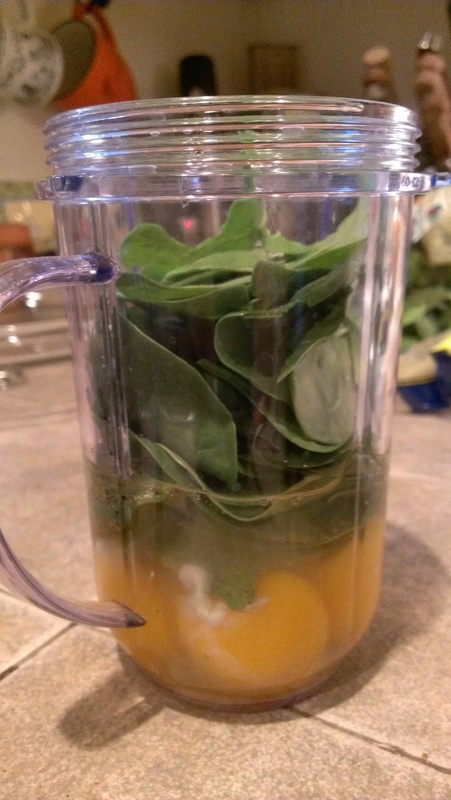 After blending the spinach and eggs for a few minutes, the mixture will be very frothy. This is a good thing because it makes for light and fluffy eggs and the spinach flavor is very subtle. Paired with a whole wheat english muffin and some orange slices, it’s an easy, healthy breakfast I can throw together quickly, even when we’re running late. Sorry about leaving all those dirty dishes, sweetie! No problem, darling. That’s why they invented dishwashers! I do love Tara’s green eggs, and have become addicted to them myself. This is also a fun, great way to sneak a serving of vegetables onto a kid’s plate…they’ll never even taste the spinach. And if they balk, tell them it’ll make ’em big and strong. Just like Popeye. Happy February 17th! There are three holidays on the ol’ food calendar today: National Indian Pudding Day, National Cafe Au Lait Day, and National Cabbage Day. When given an option we’re likely to avoid a dessert, since there are so many. And drinking coffee is too easy. So, we opted today to celebrate National Cabbage Day. Do you know where cabbage grows? In a cabbage patch, dolls and guys. Wild cabbage existed long before creepy looking dolls, first appearing in England. It was cultivated and domesticated around 1000 B.C. and spread throughout Europe, where it grew very well in the cool northern climate. Greeks and Romans believed cabbage had medicinal properties, and could help those suffering from gout, headaches, and poisonous mushroom ingestion. Dutch sailors went so far as using sauerkraut to prevent scurvy. By the 17th century it became a food staple in many countries, including Germany and Russia, and is in fact considered Russia’s National Food (a fact which surprises me…I’d have guessed beets). Cabbage is considered a good cash crop due to its short growing season (three months). 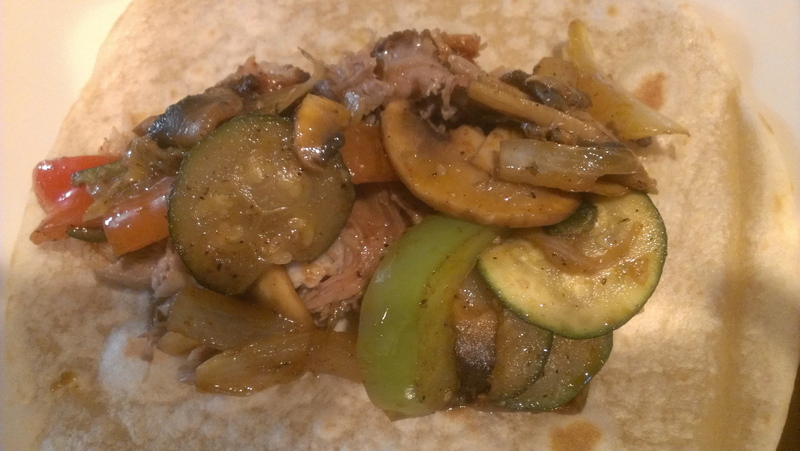 It can be used in many different ways: from eaten raw to steamed, pickled, sauteed, stewed, and braised. But the reward for Oddest Use Of Cabbage Ever goes to baseball legend Babe Ruth, who wore a cabbage leaf beneath his cap during games in order to keep his head cool. He would switch it out for a new leaf every two innings. I’m not sure what he did with the old leaf, but I gotta admit it wouldn’t totally surprise me if he just ate it. Cabbage is closely related to broccoli, cauliflower, Brussel’s sprouts, and my aunt Nancy. Interestingly, I despise cauliflower and Brussel’s sprouts, but am quite fond of broccoli and cabbage. (And my aunt Nancy, too). 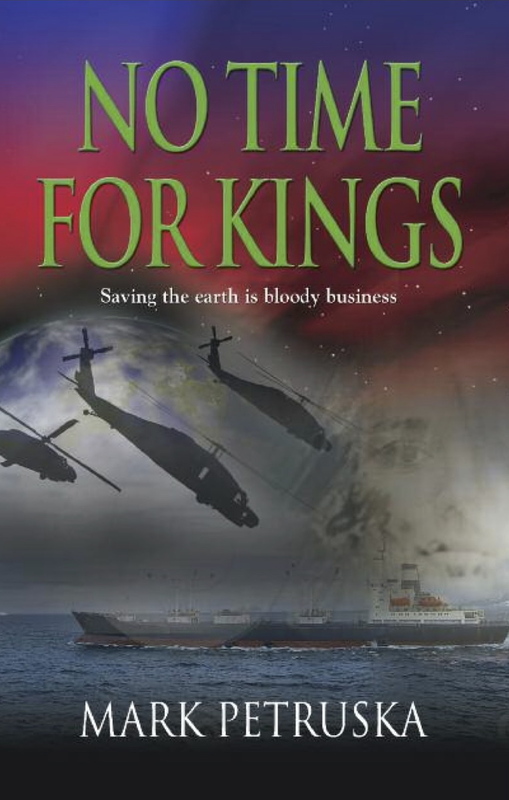 Given the variety of preparation methods, we could have gone in a dozen different directions for this challenge. 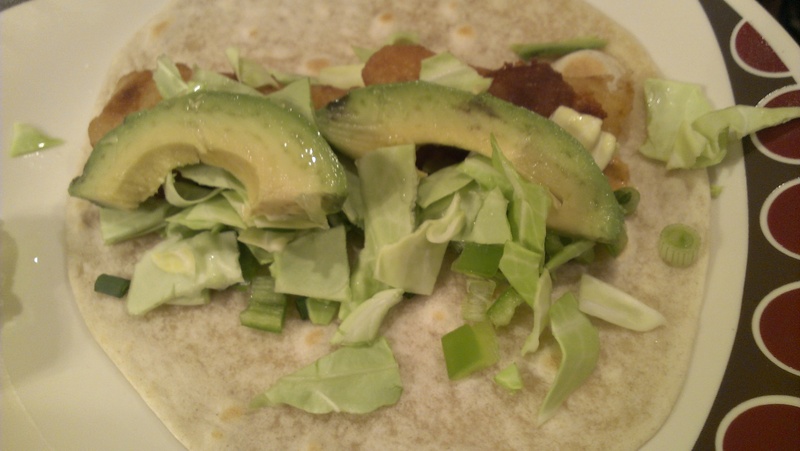 In the end, Tara made fish tacos topped with a mixture of onions, Anaheim chilies, and strips of raw cabbage. The crunchiness of the cabbage perfectly complemented the soft chewiness of the fish and the kicked-up tartar sauce. It was delicious, and the cabbage was a perfect accompaniment.